I am so appreciative of how helpful and committed you were when working with the horses and myself. - Nancy, Eureka Ca. Dr. Weldon is a health psychologist specialized in equine assisted trauma intervention. She holds certification under the Equine Assisted Growth and Learning Association (EAGALA) as an Equine Specialist, under Girls Circle she is a Certified Facilitator, and for The National Institute for Trauma and Loss in Children (TLC) she is a Trauma Specialist and Consultant. 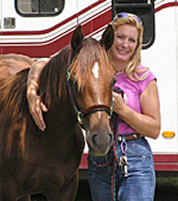 She started Ananda Ranch (Ananda meaning Bliss) in 2008 to provide Human-Horse Interactions to individuals so that they can awaken their full potential and develop the skills necessary to find and Follow Their Bliss. Unlike any other program in the world, Ananda Ranch provides an experience that integrates an educational element into the transformational process. By engaging in thought provoking aspects about the feminine, Ananda Ranch works to impact the whole individual by meeting the female gender’s unique intellectual, psychological and emotional needs. Ananda Ranch provides the tools necessary for individuals to remove personal hurdles, ignite embedded strengths, assist in reconnecting with their forgotten and neglected selves, and supports a sense of empowered self-worth. - By finding strength from within one’s self, you can start to heal life’s wounds and begin the journey toward a strong and self-assured path. Ananda Ranch is dedicated to providing Human-Horse Interactions to individuals so that they can awaken their full potential and develop the skills necessary to Find and Follow their Bliss. To help improve the quality of life among all individuals, especially those with physical, mental, and emotional challenges, through Human-Horse Interactions. Bring empowerment and an awakened sense of worth into the lives of all women and girls. Strive to promote an environment of community collaboration through shared information, experience, ideas and networking. Share the beauty, grace, passion and the respect that horses have to give.